The agricultural practices linked to the agrofuels production raises some concerns related to the environmental protection, in particular as to: cut of forests, indirect land use change (ILUC), use of the monocropping technique, use of chemical agents and genetically modified organisms (GMOs). 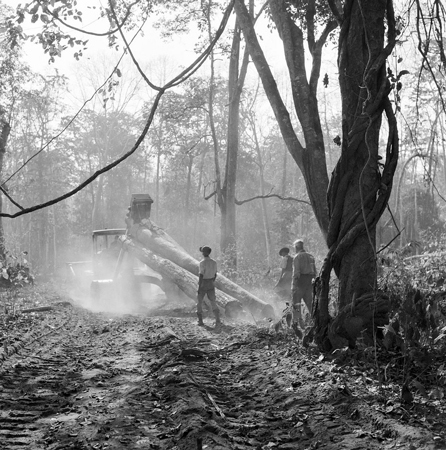 In shortage of arable lands, logging natural forests is considered a suitable alternative in order to obtain further areas where establishing monocropping plantations. The latest estimates of a Forest Peoples Programme study show that, between the years 2000 and 2005, the net forest loss was 7.3 millions hectares per year or 20,000 hectares per day. The deforestation on large-scale, due first of all to soy and oil palm plantations, produces serious and irreparable damages in terms of capacity to absorb CO2, of soil and water quality and loss of biodiversity. The International Panel on Climate Change (IPCC) estimates that deforestation is responsible for 17.3% of global CO2 emissions and the industrial agriculture sector for the 13.5% of emissions. The release of CO2 for deforestation challenges, if not even nullifies, the objective to reduce the GHG emissions by using agrofuels. The difference of emissions caused by the change in the use of land is called indirect land use change (ILUC) and it is crucial for what concerns agrofuels, in particular in calculating their GHG saving whose threshold is fundamental to evaluate their efficiency and sustainability. Fargione noted that the emissions ensued from the indirect land use changes initiated by agrofuels policies around the world may be of such a magnitude that the reductions envisaged are actually being more than nullified, with global greenhouse gas emissions in fact increasing. The technique most widely used to produce agrofuels is the monocropping because it allows to produce a high quantity of products at a great rate and, for this, it meets the needs of a large-scale production. It is well known that this method is quantitatively efficient as much as qualitatively very poor. In the long term, in fact, monocropping technique provokes soil degradation due to the modification of chemical and physical properties of soil and implies lands poorer of nutrients, with a reduced capacity to support plant life. It is so chemical and energy intensive that the amount of energy used to produce one unit of agrofuel is larger than the amount of energy that it produces. Planting GMOs permits the resistance of plants to pests and to speeding up the production process, but their impact on human health and environment is not yet clearly and totally explored. However, it is sure that they interact with the biological system where they are introduced and can shock the natural equilibrium of that system with ripple effects on flora and fauna. Moreover, once introduced in a biological context they cannot be controlled: they grow up, extend and reproduce themselves, contaminating the fields around, and although all their effects are not proved, it is known that they contain toxic substances, bacteria and virus that food has never had, what can severely affect human health. Furthermore, they contribute to the expansion of genetic homogeneity which implies the loss of thousands of species with irreparable effects on biodiversity and a greater vulnerability of organisms to pests and diseases.